Utilizing a handheld blower is a reliable way to get rid of all those stuff that make your yard look unsightly, such as foliage and debris. Acting as an effective tool to remove all unhealthy stuff from a lawn or yard, leaf blowers are certainly the best friend of every caretaker. Nevertheless, due to a wide range of leaf blowers from different brands, buyers can become easily puzzled while selecting the most suitable leaf blower. Well, in that case, it is suggested to look first for a reliable brand for the type of model you need. Among the publicized labels of brands, Hitachi is one of the top-notch brands offering superior blowers of different types. In case you looking for a gas-powered handheld crossover model providing quality equivalent to a standard commercial landscaping tool, the Hitachi RB24EAP 23.9cc 2 Cycle leaf blower is likely to end your search right away. It is one of the strongest yet lightest blowers in its category. The tool features 23.9 industrial-grade closed circuit and two-stroke motor delivering exceptional energy and stability. Ease of Use: The startup and operation are straightforward easy with a light pull or two. The weight of 8.6 lbs is like a bonus that delivers exceptional balance while cleaning a small or big yard, which consequently ensures less fatigue. Moreover, the ‘auto-return’ utility rendering the tool as ready to go, cordless blowing, low-slung mode, easy-to-clean engine, and two-finger throttle ensure comfortable usage for both homeowners and professionals. Outstanding Sweeping: At 170 mph and 441 CFM airspeed, the tool excels at sweeping. It easily moves away prickly seedpods and wet leaves along with light snow. Just one tank of gas offers much runtime. Environment-friendly: The two-stroke engine releasing fewer fumes adheres to stringent California Air Resource Board (CARB) guidelines. The design is also efficient and renders the tool as CARB Tier III compliant. This indicates less environmental impact as well as safe to use almost anywhere you desire. 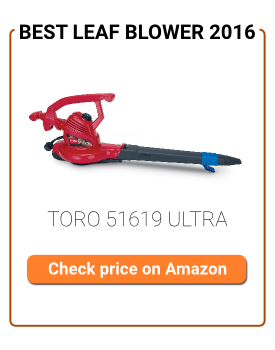 Durability: The blower features quality construction, especially commercial-grade engine that never stalls or stutters after getting warmed up..
No Mulching Possible: This Hitachi leaf blower lacks vacuum and mulching utilities. A Bit Costly: This is a fact for all gas-powered tools as against their electric counterparts. This model is also not an exception but you pay reasonably more for extra life. This Hitachi leaf blower is certainly a lightweight and comfortable tool to use, even while being fully tanked. Its 24cc, 2-cycle gas engine is sufficient to blow for up to an hour for intensive but green and user-friendly blowing. Therefore, the tool is reliable and easy to use by just anyone, especially those wishing to carry out odd jobs in the lawn.